The Reel Rhino: Transformers 3: The Greatest Movie EVER! Did that title grab your attention? I bet it did! Transformers is not the only thing happening this weekend...I do hope to catch Tom Hanks directing himself in the titular role in Larry Crowne this weekend. I am not crazy about Julia Roberts, but I always seem to enjoy when she and Hanks get together...SEE ALSO: Charlie Wilson's War. I did have the pleasure of seeing Transformers: Dark of the Moon at the Tuesday night, 9:00pm showing. Thank you Paramount for helping me from staying up till 3:00am...TF 3 was the flick I had allocated myself for a midnight showing, so I am just as happy waiting on that midnight show for HP7, Pt. 2. Dark of the Moon is getting middling to poor reviews, but Jimmy Crack Corn, and I DON'T CARE!! I greatly enjoyed this flick and I borderline loved it. I loved Transformers: Dark of the Moon with that continued state of wide-eyed wonder with my childhood brought to life in vivid living color and live action. In fact all of the Transformers movies played out in this way for me and this trilogy will always be a special set of movies in my pantheon of films, even if many others consider these in my guilty pleasures category. I am a Michael Bay apologist and I am proud of it. 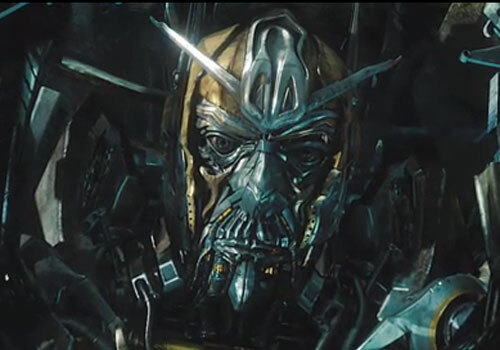 Transformers: Revenge of the Fallen was kind of a cluster, but I enjoyed it for its visual spectacle. The story in Dark of the Moon was dialed way down to a much simpler sequence of events and it helped. The combo of the simpler story and pure triumph in the visual effects makes this the most exciting of the series so far. Keep in mind that all of this is playing out under the somewhat watchful eye of Steven Spielberg. That's not a bad eye to have in your creative corner...SEE ALSO: Super 8. Spielberg is becoming kind of a guru to younger filmmakers. The world can use as much Steven Spielberg as he is willing to give. So rather than getting into the story and breaking down how this film is better than anyone has given it credit for, let me just say again that I loved it. PS: Megan Fox OUT, Rosie Huntington-Wheatley IN - A non-factor. PPS: Leonard Nimoy = Great Cameo (Star Trek fans will appreciate a spin on a classic bit of Spock dialogue). 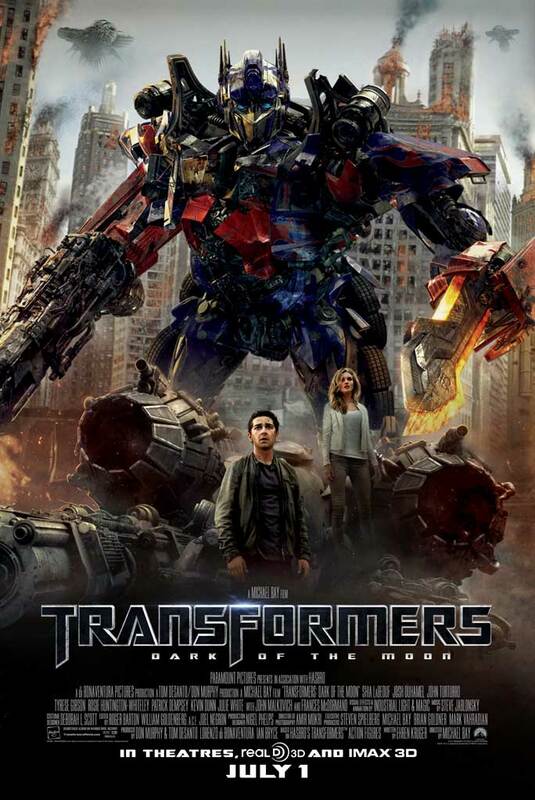 Check out Transformers: Dark of the Moon...check it out in IMAX or in one of AMC's ETX theaters. Bay sent a letter out to projectionists imploring them to check their settings when showing this flick...he utilized some light accentuation technology to improve the brightness of the 3-D showings, when viewing the movie through the polarized glasses. Happy 4th of July to all! Nothing screams the weekend of the 4th like BIG BLOCKBUSTER! Sound off if you disagree with me on TF 3! My position as a Michael Bay apologist probably skews me to some extents. Wargs, I fully expect to hear it from you too...BUT I LOVE IT! The cast for this is an even wider range of big names and the focus of TF3 is very much on the humans...Ehren Kruger is an effective storyteller...Bay is an effective Director...this flick just worked for me!! So last night I got to watch the awesomeness that is Transformers: Dark of the Moon. I enjoyed this one just as much as I enjoyed the first one and yes even the second one. I watched it at AMC in the ETX 3D. I'm not a big fan of 3D I think it’s a waste of money, but Transformers is awesome in 3D and I plan on watching it again in IMAX 3D. The movie has everything a girl could ask for: laughs, action, comedy, romance and let's not forget the eye candy: Shia LaBeouf, Josh Duhamel and Patrick Dempsey. And of course I can't leave out the guy's new eye candy: Rosie Huntington-Whiteley. She's pretty, has an accent, and a rocking body that most men will like. (Reel Rhino Note: I concur.) So even though Megan Fox is no longer here for the men to ogle and drool over, you have a new object for your affection. Not to mention her acting isn't terrible. I mean come on, I'm a fan of Megan Fox but she was just a pretty face to look at in the last two movies. I'm not an expert on all things Transformers; I've watched the movies and even some of the original TV show. I was not disappointed by this final (?) installment of this franchise. Given a few tiny editing mistakes I noticed and the fact the movie was almost 3 hours, I give it a 4.5 out of 5. The movie may not be what everyone wants it to be or hopes it to be, but for me it didn't leave me hanging and it sure didn't disappoint. Thanks Dani! Until later, Reel Rhino OUT! The only thing he's got going for him is that hes not Uwe Boll.